John Schott likes to take on big projects. During his 33 years at RIT, Schott helped form the Chester F. Carlson Center for Imaging Science and built the university’s first Ph.D. program. He won initial research funding in 1981 in support of NASA’s Landsat program of Earth-orbiting satellites that monitor global climate change and gave RIT a reputation for remote sensing. His work commitments frequently extended into the weekend, but in his limited spare time, Schott transformed his family’s simple “salt box” cottage, built in the 1940s on the Canadian side of Lake Erie, into a year-round beach house. Later, he took up woodworking when his wife, Pam, told him he needed a hobby, and now builds Mission-style couches and chairs. Schott, the Frederick and Anna B. Wiedman Professor in Imaging Science, will retire from teaching this spring. His research agenda will continue with a five-year commitment to NASA and the U.S. Geological Survey, which named him to the Landsat 8 science and calibration teams, and also with ongoing projects for the National Reconnaissance Office. One of his successors, Carl Salvaggio ’85 ’87 (imaging science) has long regarded Schott as a mentor. Their connection began in the classroom when Salvaggio was an undergraduate and Schott, a new professor in the then-Department of Photo Science. Salvaggio’s son, Philip ’12 (computer science), began studying in the Ph.D.
program in imaging science last fall. The Ph.D. that Schott developed draws high-caliber students and faculty who reflect his commitment to rigorous science. 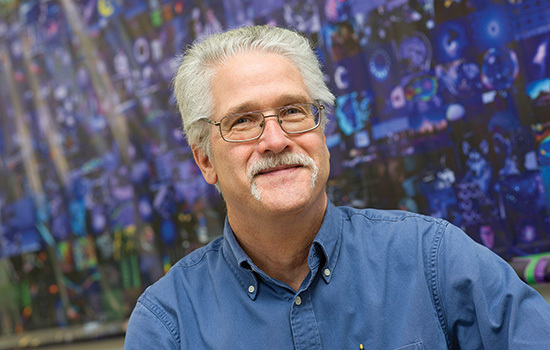 In 1980, RIT’s photo science department recruited Schott from the remote-sensing industry to jumpstart a research program and to champion RIT’s first doctoral degree. Digital technology revolutionized the photo science curriculum, and by 1985, the department had changed its name to imaging science and morphed into the first joint research and teaching center on campus. In 1989, RIT enrolled its first class of doctoral students in imaging science. The nuance of Schott’s legacy extends to the cultural and philosophic change it represented for RIT as a teaching university.